As we’ve looked at here in the past, one of the chief ways of staying trim and live longer is to avoid sedentary behavior and remain active. And as we should all know by now, we are burning through our natural resources at an alarming/scary rate. What if there were products that kept us active while reducing or eliminating our need for dirty energy? Wonder no more, because a couple products are making it possible for us to get our bodies moving while generating the energy needed to do the stuff we need to do. An average adult can use it [the Big Rig] to generate 100 watts of electricity [more than enough to charge a laptop], pump 5 gallons of water per minute, grind a variety of grains, as well as operate an air compressor, a hydraulic pump, most any hand-cranked machine, and a variety of small shop tools. It has been found to be particularly suitable for small scale agricultural applications such as cracking grains, churning butter, and pumping water. Pedal Power also offers the single-purpose Pedal Genny, which has an optional seat, but lacks the desk. They say it can be configured to power most any mechanical device requiring less than one horsepower. While these items can certainly be used for sedate desk jockeys, unfortunately electricity is just too cheap right now to affect any significant migration away from the much-love wall socket. The Pedal Power founders see them as particularly well suited for off-grid and developing world situations where electricity is either unavailable or extremely expensive. The Big Rig is available starting at $2000 and the Pedal Genny starts at $350. Prices increase depending on configurations. 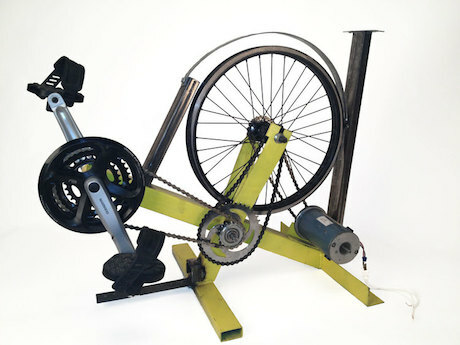 Pedal Power launched and successfully funded a Kickstarter campaign last year to fund R and D to make the units cheaper. The other product uses much the same concept, but is applied to clothes washing. 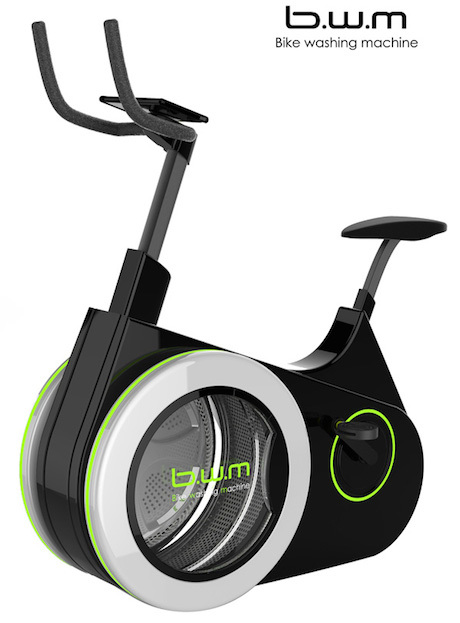 The BWM (Bike Washing Machine…not to be confused with Bavarian Motor Works) was designed by Li Huan and is an upright bike whose front wheel is replaced by a washing machine drum. The idea is very simple, though we’re not sure the same can be said about spinning your clothes manually. The BWM looks to be still very much in the concept stages of development. We might suggest to Huan a collaboration with Pedal Power so you wouldn’t need two separate machines. Electricity cheap? Hmph! Then New Zealand may be the perfect market for them!